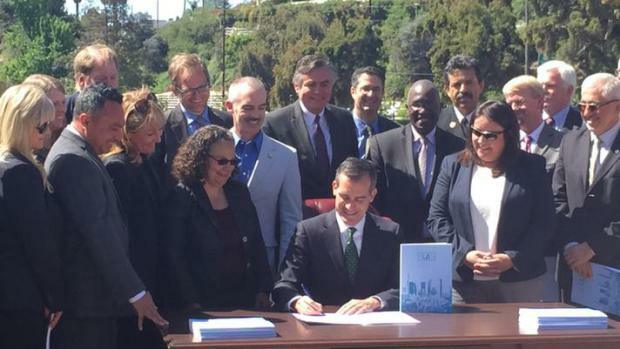 Los Angeles Mayor Eric Garcetti released a long-range plan Wednesday aimed at making the city more economically and environmentally sustainable. The Sustainable City Plan calls for “an environmentally healthy, economically prosperous, equitable future in the context of an expected population growth of 500,000 people over the next 20 years,” according to the Mayor’s office. Standing near the “Nuestra Reina de Los Angeles” (Queen of the Angels) statue at Echo Park Lake, Garcetti unveiled the plan to target “economics” and “equity” by setting goals for housing, transportation and green-job creation, and for improving air quality and quality of life for low-income residents.